We’re sorry, The Rio Nido Lodge is temporarily closed. Due to the recent flooding of the Russian River, the Rio Nido Lodge is temporarily closed. We look forward to a Grand Reopening soon. Clicking this button opens your email app so you can send us an email to be added to our mailing list. You can also ask to be added on our secure Contact Us form. This way we can let you know when we’re up and running again. 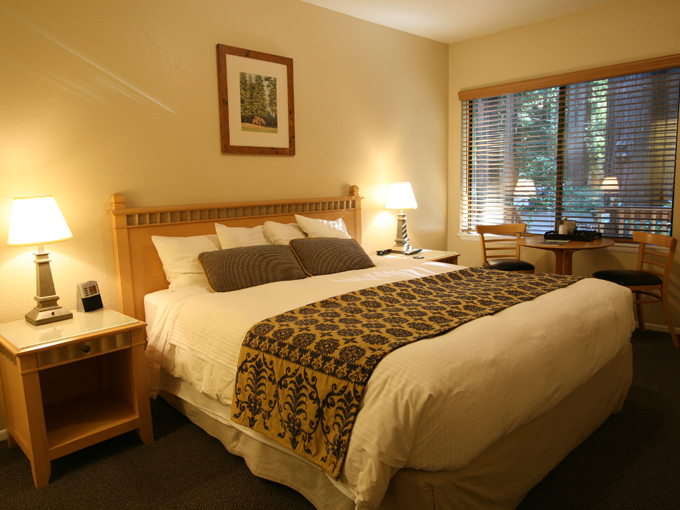 Welcome to the historic Rio Nido Lodge, a friendly bed and breakfast on the Russian River. Enjoy nearby wineries, restaurants, water fun, outdoor activities, and other attractions. Takes you to a secure site for booking your stay with us. Love being outside? The Rio Nido Lodge is the perfect place to start your outdoor adventure. Try hiking, biking, fishing, birdwatching, swimming, kayaking, tubing, zip lining, ballooning, and more. Savor our glorious Russian River Valley Wines. 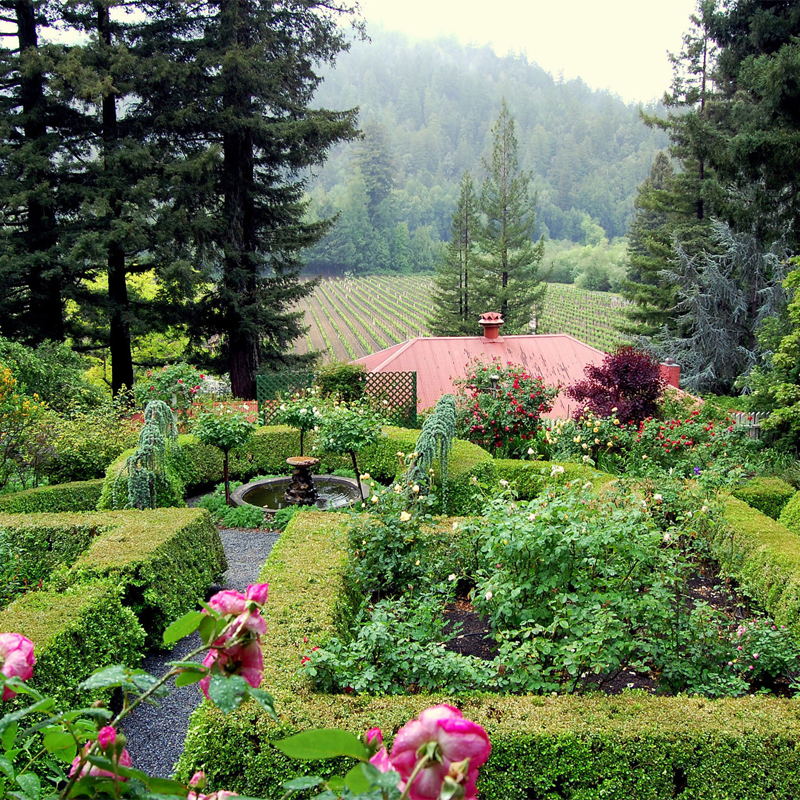 The Russian River Valley is home to some of the world’s most renowned wineries. Whether you’re planning a scenic drive past our lovely vineyards or a wine tasting spree, they’re just a short drive from the Rio Nido Lodge. Stroll among our enchanting redwood trees. Want to discover more about the soaring redwoods that surround the Rio Nido Lodge? We’re just five minutes away from the magnificent Armstrong Woods State Reserve. Or just relax and unwind here in tranquil Rio Nido. 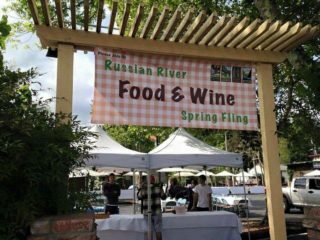 There’s lots to do on the Russian River. But if you’d prefer a fun and restful day at your home-away-from-home, we’ve got everything you need within easy walking distance. For more, see our list of amenities. Imagine a Russian River bed and breakfast with a laidback vibe and boho charm tucked away in a hamlet full of towering redwoods. The Rio Nido Lodge offers quaint historical touches. 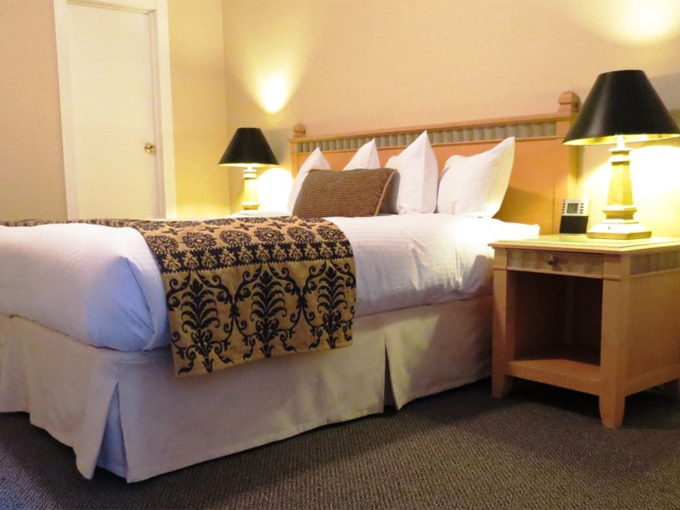 But our rooms also have modern amenities like wifi, flat-screen TVs, and refrigerators in every room. And each day, we send you off on your adventures with a deluxe continental breakfast with fruit, pastries, cereal, muffins, and a hearty homemade dish. We also have a great coffee bar in the mornings. We also welcome your kids and your dogs. These rooms are great for outdoorsy types. With easy parking right outside, you can quickly load your gear in and out for your Russian River adventures. And bring Fido along! These rooms are dog-friendly. 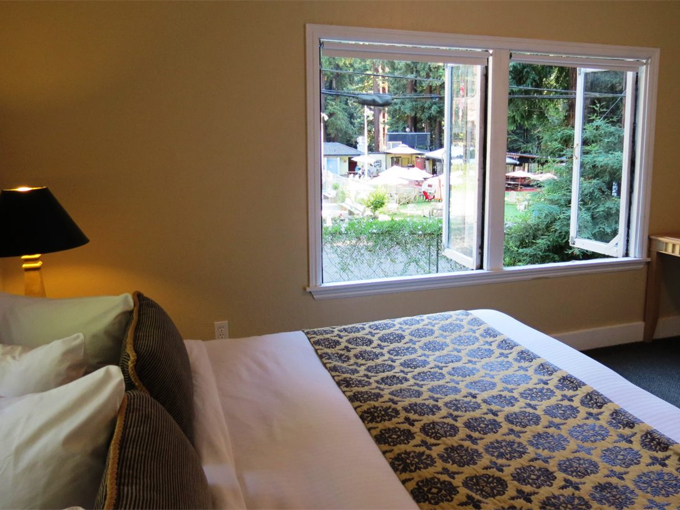 These rooms open onto a lovely shared courtyard tucked among the redwoods. What a perfect place to sip a Russian River Valley Pinot Noir, Sauvignon Blanc, or Chardonnay after touring our wineries. We love these breezy, historic rooms that overlook our little hamlet in the redwoods. The nicely furnished upstairs common area also makes these rooms the perfect thing for a gathering of family or friends. We love this quaint little cottage. With its snug kitchenette, private patio, and separate parking area, it’s the perfect romantic escape. But if you’re feeling social, you can have some friends over. 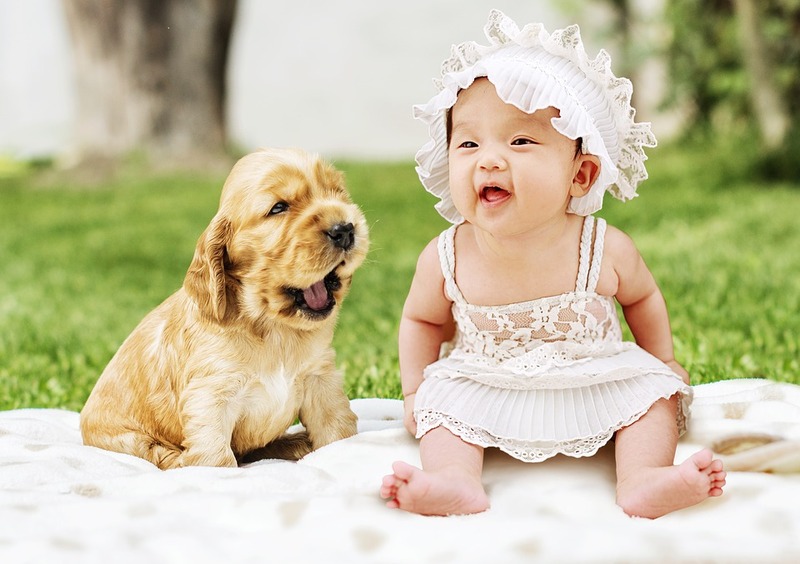 If you love traveling with your pooch, dogs are welcome in our Forest Rooms and our dog park is just a short walk away. And if you’ve got kids, then we’re definitely one of the best places to stay in the Russian River Valley. Our next door neighbors at the Rio Nido Roadhouse have a restaurant, bar, a swimming pool, and a grassy area for kids to play. On some nights, they have musical acts where both the kids and the grownups get to have some fun. The Rio Nido Homeowners Association hosts all kinds of family-friendly events during the summer. These include Peewee Mini Golf nights, pancake breakfasts, art shows, and old-timey barbecues with lots of music and games for Memorial Day, the Fourth of July, and Labor Day. Even during the off-season, we have a wonderful little neighborhood, community garden, playground, and picnic area to explore. 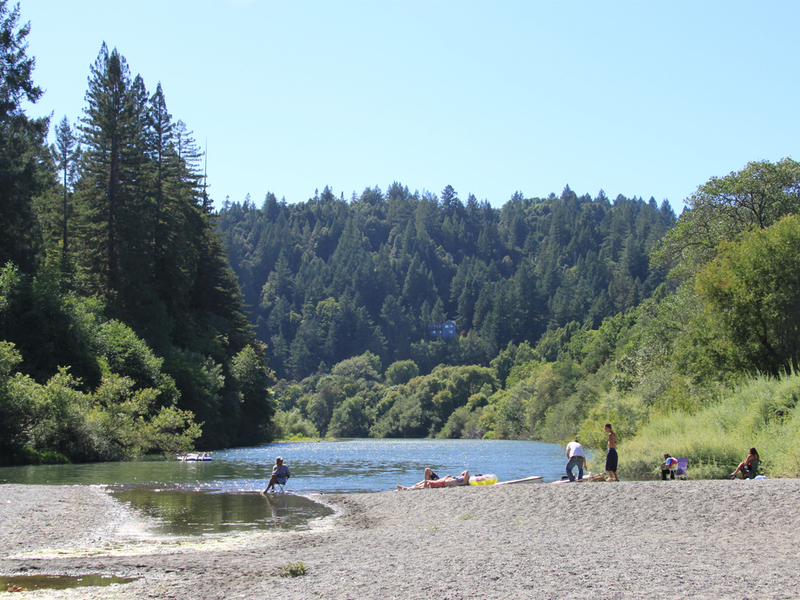 The Russian River area has always been a playground for outdoor enthusiasts. There is so much to see and do. 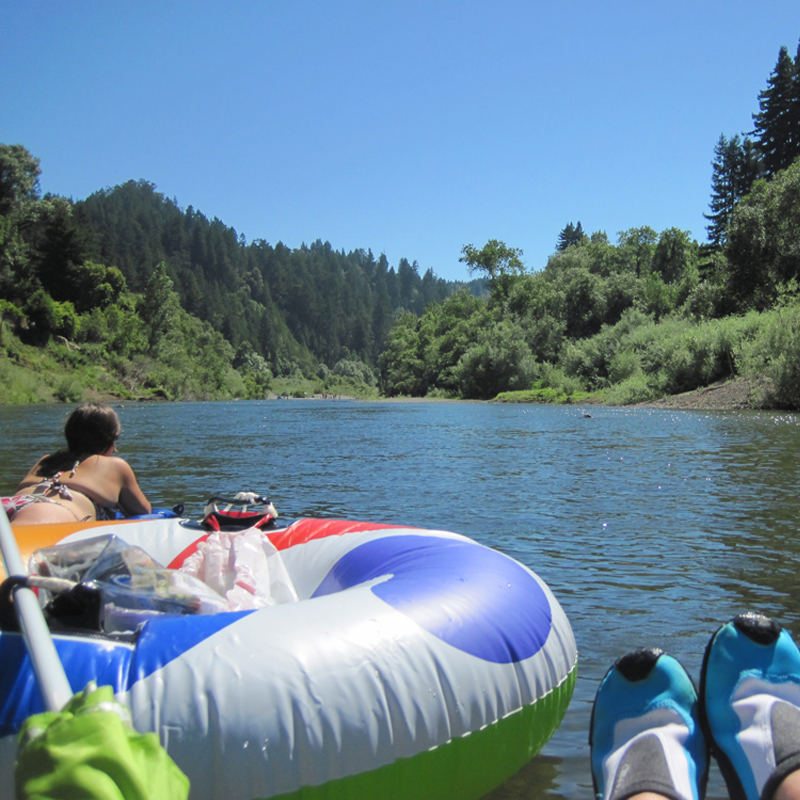 Whether playing in the water, or relaxing on the beach, no day is wasted on the Russian River. Can you hear it calling out to you? 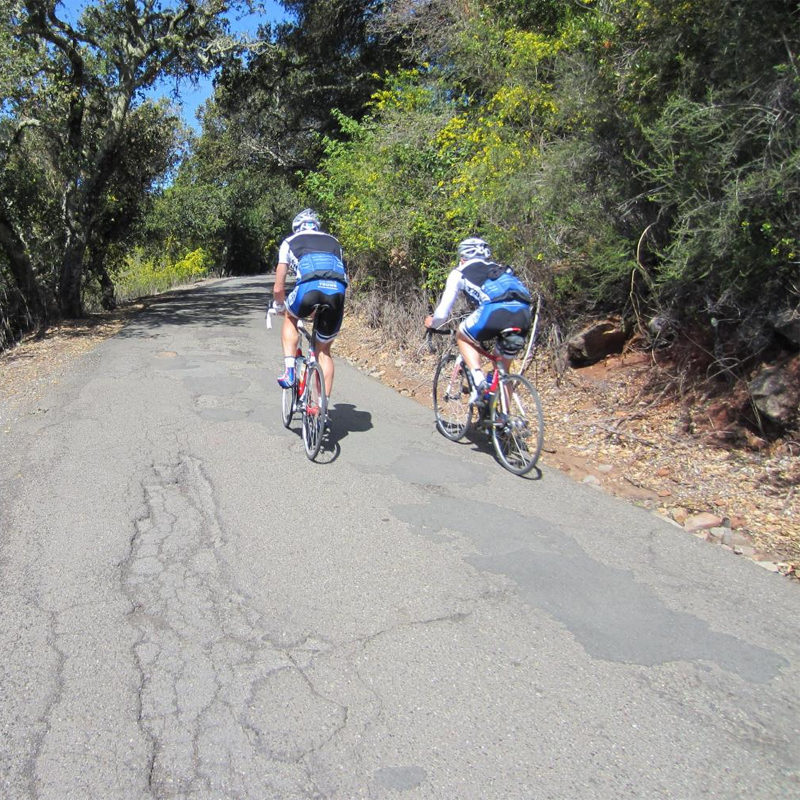 Cyclists and hiking enthusiasts of all skill levels come to enjoy the picturesque settings within the Russian River area. 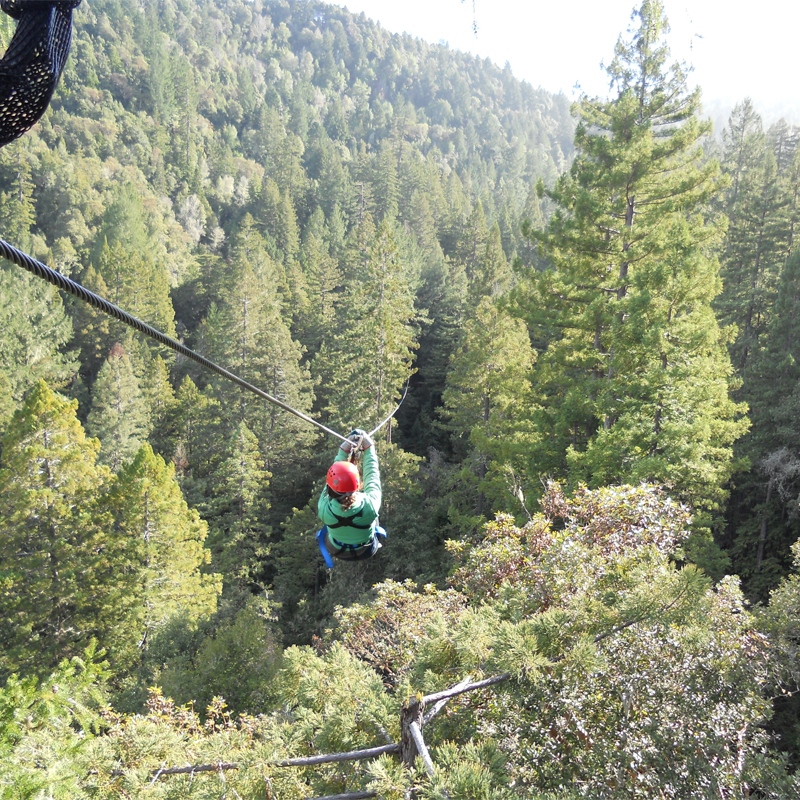 Experience a different kind of peace, serenity and adrenaline while playing among Northern California’s redwood trees. Sonoma County is home to over 400 world-class vineyards, many of which are within a short drive from the Russian River Valley. The historic Rio Nido Lodge is located in the heart of the Russian River Valley in the Sonoma Wine Country. We’re only 14 miles from Highway 101, 18 miles from downtown Santa Rosa, 15 miles from the coast and Jenner-by-the-sea, and just a 73-mile day trip away from San Francisco. The lively tourist town of Guerneville, with its restaurants, shops, and galleries, is just two miles west of us. And the famous Korbel Winery is just one mile down River Road. Also, the giant redwoods in Armstrong Woods State Park and a variety of Wineries are just a few minutes’ drive away. But be forewarned. 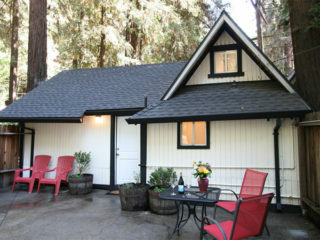 Our snug little enclave in the redwoods is so lovely, you may decide not to get in your car. Our building is just a short walk to the Russian River and Rio Nido’s community garden, dog park, playground, and picnic area. Plus, our next door neighbors at the Rio Nido Roadhouse serve up great food, drinks, and live music. During summers, the Roadhouse also offers a swimming pool with day, week, and season passes. Meanwhile, the Rio Nido Home Owners Association (RNHOA) hosts holiday weekend barbecues, pancake breakfasts, art shows and more. Take US Highway 101 to Exit 494 (River Road-Mark West Springs Road). Follow the signs to River Road. Follow River Road for 14 miles. When you see the large red sign for Rio Nido, turn right onto Canyon 2 Road. In 0.1 miles, turn left onto Wood Road. In 39 feet, the Rio Nido Lodge will be on the right. 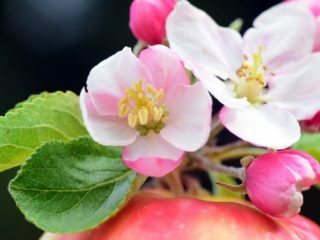 Keep up with what’s happening in the Rio Nido, Guerneville and River Road communities. Find out the latest news for Rio Nido Lodge fans on Facebook and Twitter.